Mount Herzl (Mount of Remembrance) is the site of Israel's national cemetery and other memorial and educational facilities, found on the west of Jerusalem beside Jerusalem Forest. It is named after Theodor Herzl, the founder of modern political Zionism. Herzl's tomb lies at the top of the hill. Yad Vashem, which commemorates the Holocaust, lies to the west of Mt. Herzl. Israel's war dead are also buried there. Mount Herzl is 834 meters above sea level. Every plot section in Mount Herzl has a broad plaza for memorial services. Most state memorial ceremonies for those killed at war are conducted in the National Military and Police cemetery. In 1934, Zionist leader Menahem Ussishkin organized the re-interment of Leon Pinsker in Nicanor Cave on Mount Scopus in an attempt to build a pantheon for the great leaders of the Jewish nation. Ussishkin was buried there himself in 1941. When Mount Scopus became an enclave, cut off from Jerusalem, the implementation of this plan was no longer feasible. During summer 1949, Theodor Herzl's remains were reinterred on a hill in West Jerusalem which faced the Mount of Olives from a distance and renamed in his honour, Mount Herzl. In November 1949, soldiers who fell during the War of Independence in the Jerusalem area were buried on the north slope of the hill. In 1951 the government decided to establish a national cemetery for Israeli leaders and fallen soldiers at Mount Herzl. It has served this purpose ever since. Apart from Theodor Herzl, Mt. Herzl is the burial place of five of Israel's prime ministers: Levi Eshkol, Golda Meir, Yitzhak Shamir, Yitzhak Rabin (who is buried beside his wife Leah) and Shimon Peres. Israeli presidents are also buried on Mt. Herzl, as are other prominent Jewish and Zionist leaders. 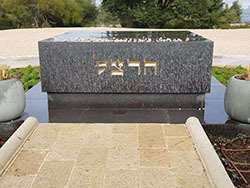 The Great Leaders of the Nation's Plot or Memorial Park holds the graves of several Prime Ministers, Presidents, Knesset speakers and other chosen national leaders of the State of Israel. It forms a separate section of the Mount Herzl cemetery from that of the leaders of the Zionist Organization (after 1960: World Zionist Organization), which is situated nearby. The Hebrew name Helkat Gedolei Ha'Uma is used in common parlance either in a narrower meaning, for the State of Israel leaders' section, or in a wider one, which includes pre-state Zionist leaders. Buried there are Presidents Zalman Shazar and Chaim Herzog, Shimon Peres and Prime Ministers Levi Eshkol, Golda Meir, Yitzhak Rabin and his wife Leah Rabin. Other notable graves are those of the first speaker of the Knesset, Yosef Sprinzak and his wife Hanna, the first Minister of Finance, Eliezer Kaplan, and Jerusalem mayor Teddy Kollek. Despite the national significance of the cemetery, some Israeli leaders were buried elsewhere, most notably Chaim Weizmann (buried at Weizmann House), David Ben-Gurion (buried at Midreshet Ben-Gurion) and Menachem Begin (buried at Mount of Olives). Deciding who should be buried on Mt. Herzl has sometimes been controversial. For example, the decision to bury Ze'ev Jabotinsky, who died in 1940, on Mt. Herzl, was fiercely opposed by many Labour Party stalwarts, who claimed that Jabotinsky was an ultra-right nationalist undeserving of such an honour. Only in 1964 did Prime Minister Levi Eshkol decide in favor of burying him there, in the interest of promoting national reconciliation and setting aside political grievances. Soldiers awarded with the Medal of Valor may also be buried at Mount Herzl. I wish to be buried in a metal coffin next to my father, and to remain there until the Jewish people will transfer my remains to Eretz Israel. The coffins of my father, my sister Pauline, and of my close relatives who will have died until then will also be transferred there. When Herzl died a year later, he was interred in Vienna. Forty-five years later, Herzl's remains were brought to Israel and reinterred in Jerusalem. The location of the burial site was selected by a special state commission in the top of a hill in Jerusalem next to Military cemetery of Jerusalem. He was buried on 17 August 1949. A temporary stone marked his grave for several years until the site was developed into a national cemetery. Sixty-three entries were submitted in the competition for the design of his new tombstone. The winner was Joseph Klarwein's design, consisting of an unadorned black granite stone inscribed with the name Herzl. The area around his tomb has been expanded into the plaza where the first Independence Day ceremony was held in 1950. Despite Herzl's wishes, his daughter Pauline and son Hans were not originally buried beside him. Their remains were moved to Mt. Herzl in 2006. A third daughter was murdered in the Holocaust and her place of burial is unknown. The small Stephen Norman Park, located between the Herzl Museum and the Herzl Educational Center, is dedicated to the memory of Herzl's only grandson, who took his own life in the United States in 1946 after learning about the fate of his family during the Holocaust and being confronted with Jewish misery in the Displaced Persons camps, and was reinterred on Mt. Herzl in December 2007. Herzl's parents and sister are also buried at Mount Herzl. The Victims of Acts of Terror Memorial is the main memorial for all victims of terrorism in Israel from 1851 until today. The Memorial was opened in 1997, and every year a ceremony is held on the plaza, in memory of the victims of terror. The memorial is located in the National Civil Cemetery next to Helkat Gedolei Ha'Uma. The main Israel Defense Forces cemetery is located on the northern slope of Mt. Herzl. It was established in November 1949, when soldiers who fell in the Jerusalem area were buried here. In 1949, the government decided to turn the site into the main cemetery for IDF members who have fallen in the line of duty. The Israel Police cemetery, for police officers who have fallen in the line of duty, is also located there. All soldiers, regardless of rank or unit, are buried side by side. The gravestones are plain and unadorned, only recording name, rank, and place and date of birth and death. The military cemetery also honours the memory of Israel's fallen Christian, Muslim, and Druze soldiers who have served in the Israeli security forces. The Garden of the Missing in Action is a Tomb of the Unknown Soldier Memorial and Memory Garden for soldiers of the Israel Defense Forces and those who fought for the pre-state Land of Israel whose resting places are unknown from 1914 until today. The garden was established on 29 February 2004 in a ceremony attended by army chiefs, the Israeli Defense Minister Shaul Mofaz, and members of the Jerusalem Municipality at the National Military and Police cemetery. The garden also contains memorials to those lost aboard the submarine INS Dakar and the 23 Who Went Down at Sea. An annual memorial service for the Missing Soldiers of Israel takes place in the garden's main plaza on Seventh of Adar day. The garden includes "empty graves" and stone monuments to the memory of missing soldiers. At the entrance to the garden, there is a small plaza where memorial ceremonies to the missing are held. On the north side of the plaza there is a memorial to the missing sailors of the INS Dakar submarine, which sank in the Mediterranean sea. On the north side of the plaza is a memorial wall bearing the names of all missing soldiers and fighters from 1914 until today. On the top of the wall there is a waterfall. A national Rememberance Hall built at the entrance to the Mt. Herzl National Military and Police cemetery was opened to the families of fallen soldiers for the first time during the final stages of it's construction on May 2, 2017. The new memorial is intended to honour the memory of the 22,684 soldiers and security personnel who have fallen defending the land of Israel since 1860. It is built in the shape of a torch rising some 18 meters where a fire will burn all year long. The Ministry of Defense plan includes all 22,684 names, each with a candle to be lit twice a year—once on the anniversary of the soldier's death, and on Memorial Day, as well as Tomb of the Unknown Soldier. The estimated cost of the project is NIS40 million. Above the Herzl Museum and the main plaza is the Nations Garden, where trees have been planted by visiting presidents and heads of state. There are two small observation decks looking out over Jerusalem. A menorah sculpture stands opposite the main plaza entrance.